For sure you will forever remember your momentous wedding day, but do you know what guests will always remember from it? It’s the food that you will be serving during your special big day. And because of that, you have to make it possible to send your guests home full with the best dishes and drinks. But before anything else, you have to make extensive planning first, particularly in planning the menu templates of your wedding. 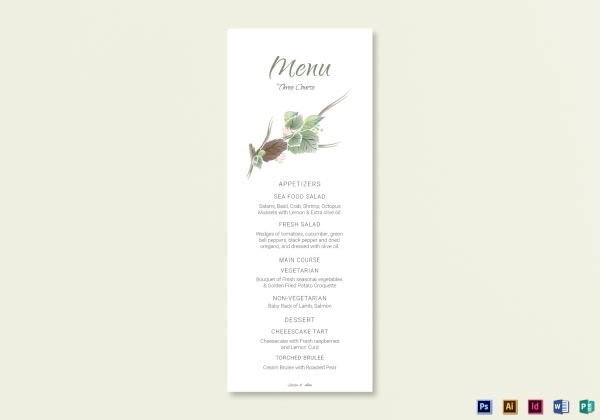 A wedding menu can come in so many forms but it will all boil down to your choice of wedding menu template. 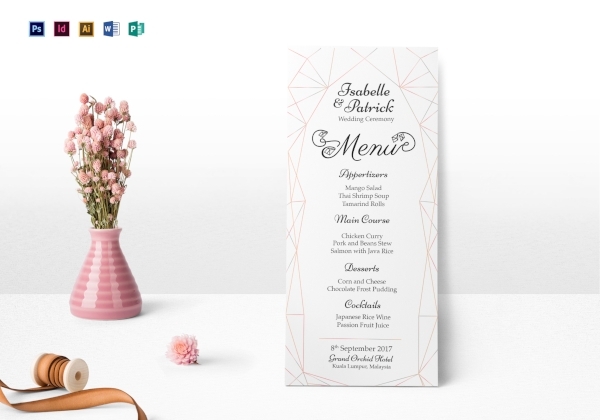 In this article, you will no longer have to worry whether you have chosen a wrong menu template or not for we have already provided a wide array of wedding menu templates and examples that are professionally made and are of high quality. Are you a wedding planner? One of the possible things that you need to deal with as a planner are clients who would profusely haggle your service fees, assuming that being a wedding planner is a piece of cake when in fact, it is far from being easy. And with that, you really have to provide a wedding planner menu, similar to the given template above, that lists down the rates of your service packages. It is in this way that your clients will know that there is a standard that they can’t just simply ask to lower down. Planning to have a wedding by the fall or autumn season? It is highly suggested that you use this fall wedding menu card since it is appropriate to the season for when you will be having your special day. By making use of this template, you will be able to properly organize the specific courses that you will be serving during your wedding that starts off from the appetizers, main course that caters both vegetarians and non-vegetarians, and desserts. Make sure your guests will be well-informed about the dishes that you will be serving during your wedding reception by providing this reception wedding menu. As mentioned in the introduction, the remarkable thing that will remain in the minds of your guests will be the food and drinks they have tasted during your wedding reception. Make it even more memorable by giving them a food menu that can also serve as memorabilia of your special day. Wedding menus can be presented in many ways possible and that will only depend on the kind of theme that you have for your wedding or the food service that you will have during the wedding reception. You can have it in rustic styles, such as the given template above, you may also follow a minimalist layout and even a modern or contemporary one. 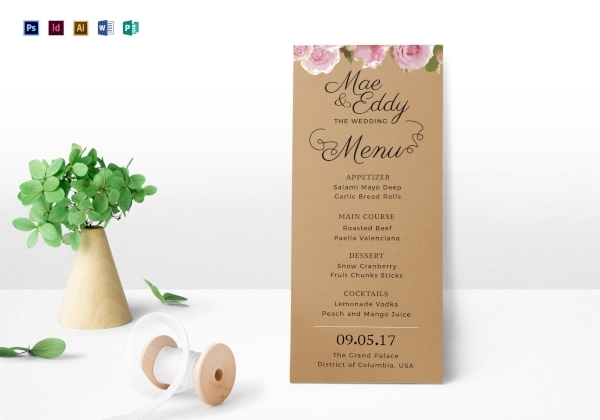 So if you want to have a rustic effect on your wedding menu design, you can always download and make use of the given wedding menu template above that will help you in getting started. Having a wedding ceremony during the summer season is the best way to make one’s wedding celebration even more colorful and special since anyone can associate summer with vibrant and fresh design elements. 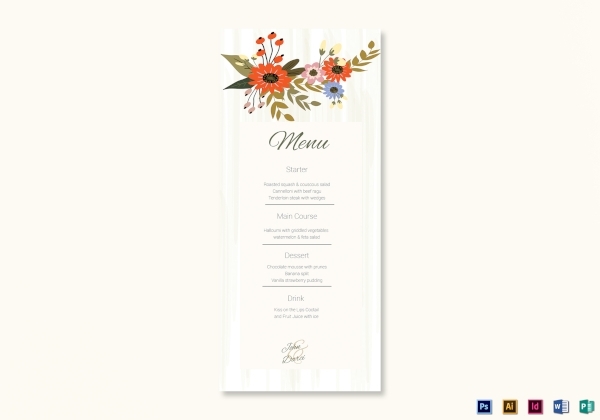 Make sure that you will reflect this in your menu design by downloading this summer floral wedding menu card that contains summer-related decorative elements that are simply perfect and appropriate for the season for when you will be having your big day. As mentioned in the introduction, the remarkable thing that your guests will remember from your special day is going to be the food and drinks that they have tasted during your wedding day. 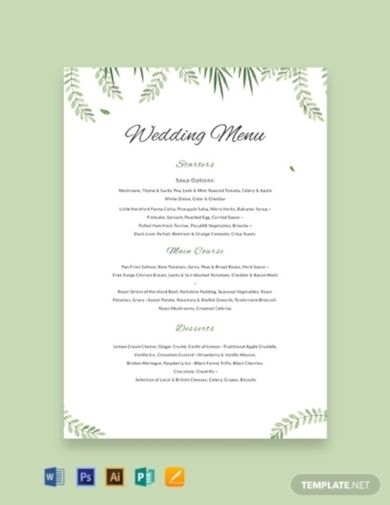 Make your guests even more excited about your upcoming wedding by making use of this wedding buffet menu template where you can place and organize the wedding menu items that you would want to serve during your wedding day. If you are under a strict budget for your wedding, one way of lessening the costs is by designing your own wedding menu. And if you are not yet adept at designing any designing material, then download this wedding ceremony menu that serves as your jump start to wedding menu designing. Worry not for this template can be edited even in the most basic editing software program such as those that are under Microsoft Office Suite. Are you now ready to create the best wedding menu yet for your upcoming wedding? Then do make sure that you will download and make use of this wedding menu that can help you in achieving this goal. This template features a floral design that will surely make your guests even more excited about your upcoming special day. 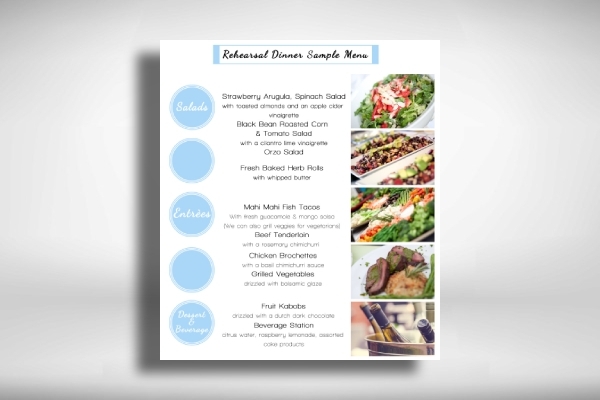 This template also allows you to categorize your menu items according to the basic courses of a meal. 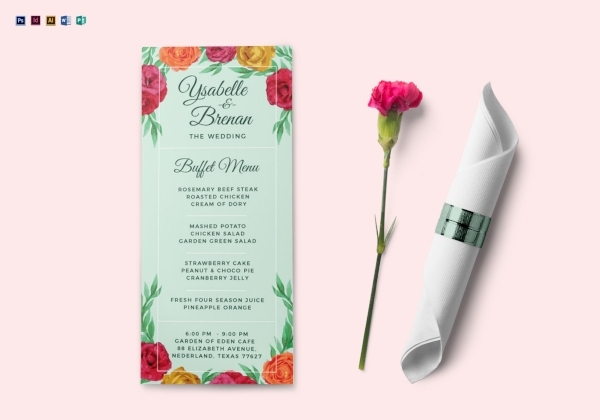 Do you want to keep things simple for your wedding menu’s design? 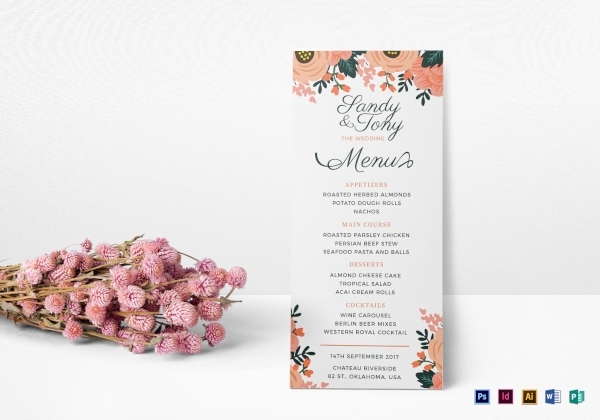 Then make sure you utilize this wedding menu that will help you achieve the kind of layout that you want your wedding menu to have. But despite its simplicity, this template already contains suggested categories that allow you to categorize your wedding menu according to the basic three courses of a meal that you will be serving during your wedding that starts from the starters or the appetizers, the main course, and of course, the dessert. Rehearsal dinners are basically your way of giving your guests a sneak peek of what is going to happen during your big day. But do not just treat a rehearsal dinner lightly even if this is not the actual wedding dinner because it is also through this that you will be able to anticipate the possible things that might go wrong on your actual wedding day. One way of preparing yourself for this day is by making sure that you have a wedding rehearsal dinner menu that will help you in organizing the specific menu items that you will be providing to your guests. 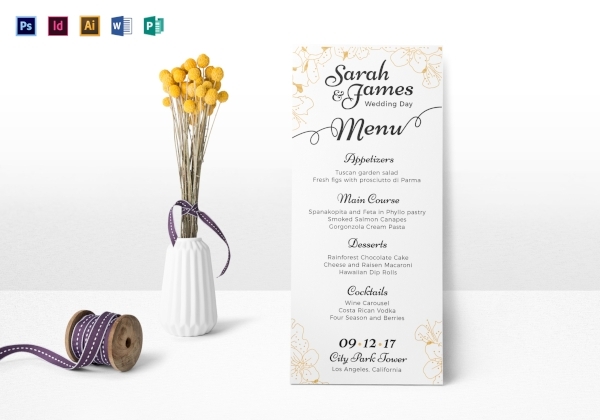 Keep in mind that the wedding menu templates provided in this article can be downloaded conveniently for your own use and can be customized using various editing software programs such as those under Microsoft Office Suite and the Adobe Creative Cloud. So what are you waiting for? 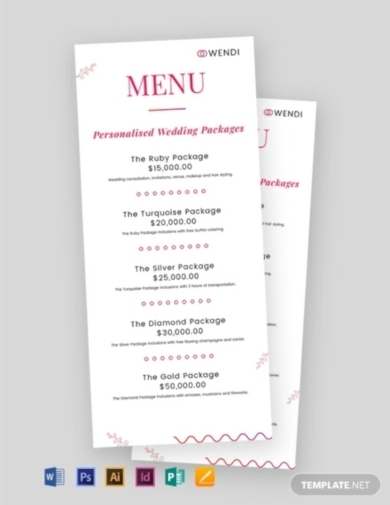 Start creating your own wedding menu design now!